Manchester fired a team score of 371. Northfield finished second with a 401, Wabash fifth with a 436. Southwood had an incomplete team. 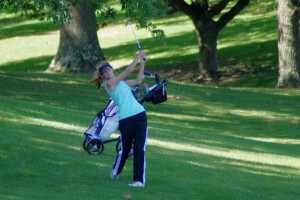 Manchester’s Kelsey Eichenauer was medalist of the meet with an 87. Chloe Kendall of Southwood, Lydia Little and Samantha Kissell of Manchester finished tied for second with a 93. Bella Carrillo of Wabash was fifth with a 95, Emma Wynn of Northfield tied for seventh with a 97, Cora Barnett of Manchester was ninth with a 98 and Katie Springer of Southwood plus Kearston Stout and Braelyn Deeter of Northfield shot a 100 to tie for tenth. All of these players earned all conference honors. Wabash : Lindsey Mattern 101, Halle Miller 120, Kylie Carmichael 120, Lacey Crist 149.